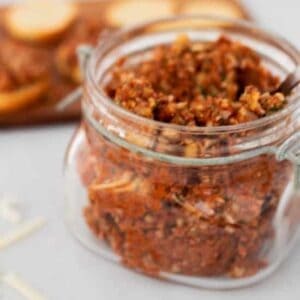 This Walnut Pesto is definitely the best pesto I’ve ever tried – it’s loaded with walnuts, sun-dried tomatoes, basil and parmesan cheese and perfect to pair with pasta or bread. It comes together in just a few minutes and once you’ve tried it you’ll never want to use storebought pesto again. What is Pesto Made From? Pesto is generally made by mixing together some kind of nut, some kind of herb, some kind of cheese and then some olive oil until you reach the consistency you like. Traditionally made with a mortar and pestle, most people nowadays use a food processor for it. For maximum flavor go ahead and use the mortar and pestle though – it really does make a difference. The classic green pesto most of us relate to the word “Pesto” is traditionally made with pine nuts, parmesan cheese, basil, garlic and, of course, olive oil. Sometimes pecorino is used in place of parmesan cheese, and sometimes both. Either way, this makes a delicious type of pesto, especially when made in the traditional mortar and pestle way. I, however, always find myself gravitating toward the red version. 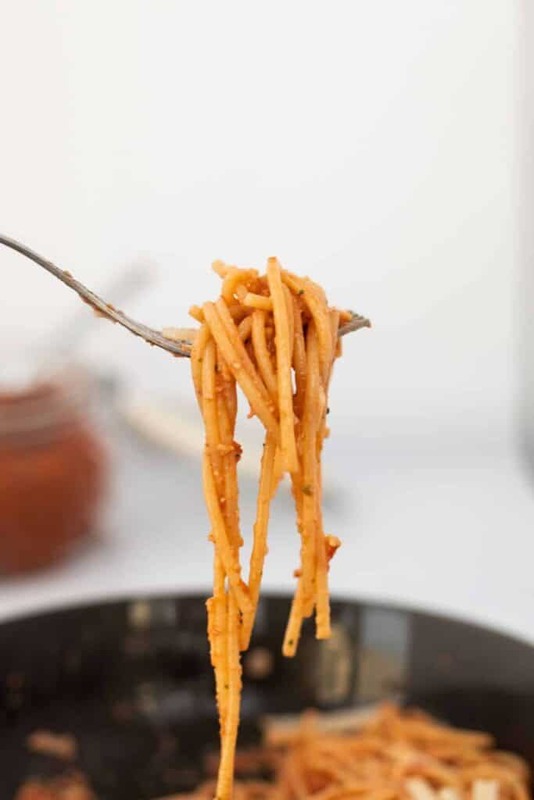 Red Pesto can be made in all kinds of ways, but almost always do they include sun-dried tomatoes. 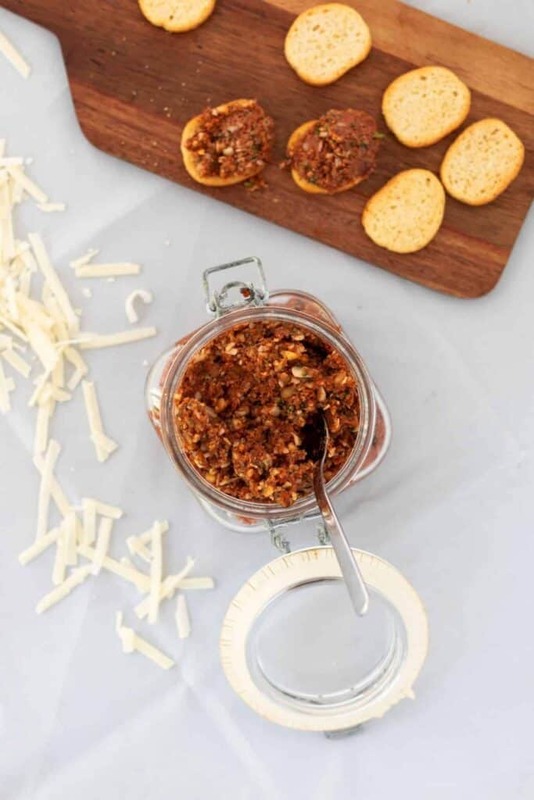 Sun-dried tomatoes are such a big favorite of mine – providing such delicious sweetness as well as a slight acidity that gives the pesto a more complex flavor profile. Feel free to try your hands at your own versions! Grab whatever nuts, herbs and hard cheese you love and mix it up with some olive oil and maybe add some garlic, some sun-dried tomatos, some roasted bell peppers or egg plant… and just whatever else you think would make for a tasty pesto. Mix it, taste it, and adjust to suit your own tastebuds. Now making this walnut pesto is super easy and it’s done in just a few minutes. Use a food processor and you won’t even have to chop anything ahead of time. 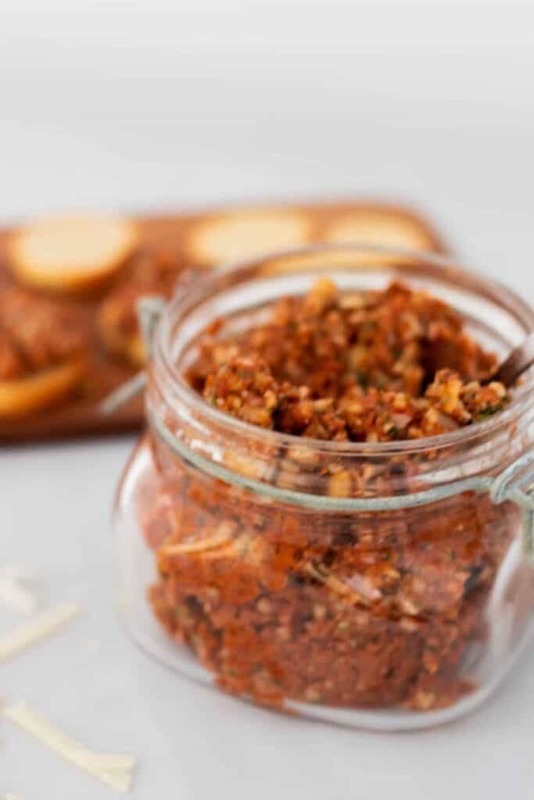 Star by shredding your parmesan cheese and then place it in the food processor together with the walnuts, basil, sun-dried tomatoes and garlic. Mix, and add oil from the sun-dried tomatoes (or any other olive oil of your choice) until you’ve reached your desired consistency. The addition of the sun-dried tomato oil really makes a huge difference. It’s loaded with flavor and why on earth waste good olive oil? I keep my pesto pretty coarse, but just mix it a bit longer and you’ll have a super smooth pesto to match the consistency of the storebought version. I also keep it kinda low in oil – but if you like more oil, then by all means – add it. If you’re using your pesto as a sauce I even recommend it! Good news! You do not need to finish all of your Walnut Pesto in one sitting – even if you’ll probably want to. Store your Walnut Pesto in an air-tight container in the fridge – it will keep for at least a week. If you’re not using it regularly you can top it with some oil to ensure it doesn’t go dry. I never have this issue though – I’m there grabbing some pesto several times a day! If you want to keep your walnut pesto for longer, it freezes really well and will last for months. Just make sure to freeze it in portion-sized containers as it will be hard to divide when frozen. You can even freeze your pesto in an ice cube tray to make for easy access to smaller amounts, perfect whenever you want to treat yourself. Just pop out a few pesto cubes every time you feel a Peto Pasta craving coming on! Walnut Pesto, like most kinds of pesto, is so versatile and you won’t have any trouble making away with it. Walnut Pesto is delicious served with pasta. 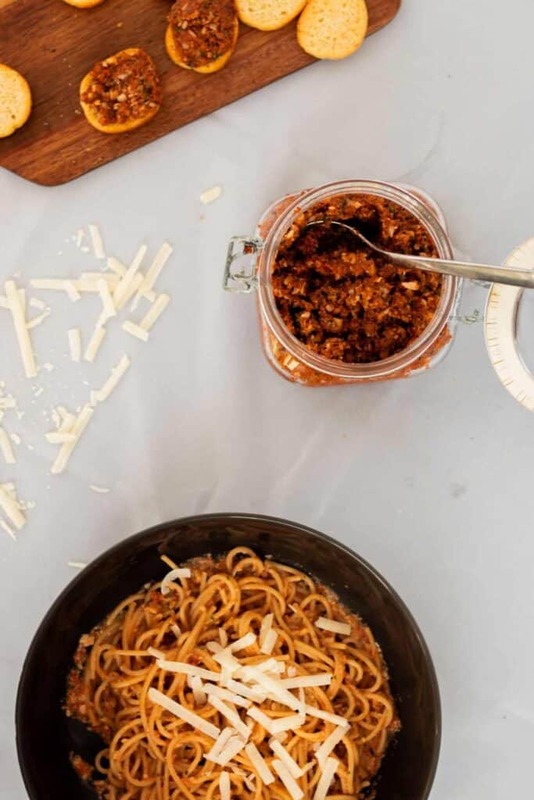 Just cook up some nice spaghetti or your favorite type of pasta, even better if it’s homemade… Then mix the pesto with a little bit of pasta water to create a creamy sauce, add in the pasta and top with freshly grated parmesan cheese, fresh ground black pepper and sea salt flakes. How’s that for super easy and super yummy?? If you’re looking for something more than just Pasta & Pesto – just add some of your favorite roasted veggies like I did for this deliciously simple Roasted Vegetable Red Pesto Pasta. Throw in some black olives as well, if that’s your thing! Walnut Pesto is delicious as part of an appetizer. 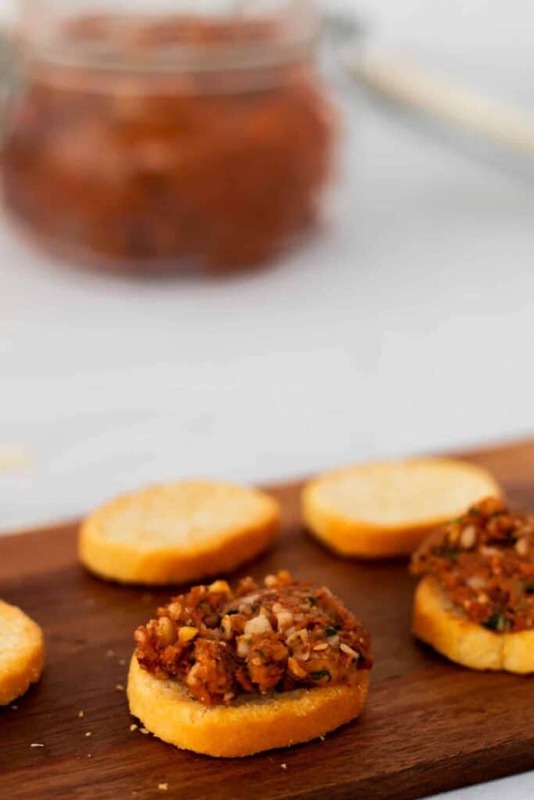 Use it to top crostini for a super easy canape, fill mushrooms with it or incporporate it as part of a cheese platter. Either way – it will be delicious! And how impressed will your friends be when you tell them you actually made the pesto yourself?? It doesn’t matter if it’s breakfast time, snack time or you’re being all Italian and fancy and serving some bread to go along with your Saturday night dinner – Walnut Pesto is delicious as a topping for bread. Best served on top of the airy, delicious, Meditteranean type bread it’s really a perfect topping for any kind you prefer. Ever had one of those fancy pizzas with all kinds of nice cheeses, cold cuts and maybe even some ruccola on top? Yeah, try that with pesto as well. Add it on top of the whole thing when it has about 5 minutes of cooking left, and you’ll soon have a delicious and restaurant worthy pizza at home! Walnut Pesto is also delicious as a sauce for meat and chicken, or even stuffed inside a nice piece of chicken breast. If using as a sauce you might want to add a bit more olive oil, to make it more saucy, but if your stuffing something with it this consistency should be perfect. How I finished this batch of Walnut Pesto?? I had some on my pasta, a little bit on crostini, and then devoured the rest on top of brad for breakfast. Might have just been the best week of breakfasts I ever had! What’s your favorite way of using Pesto? Let me know in the comments below! And if you tried this? 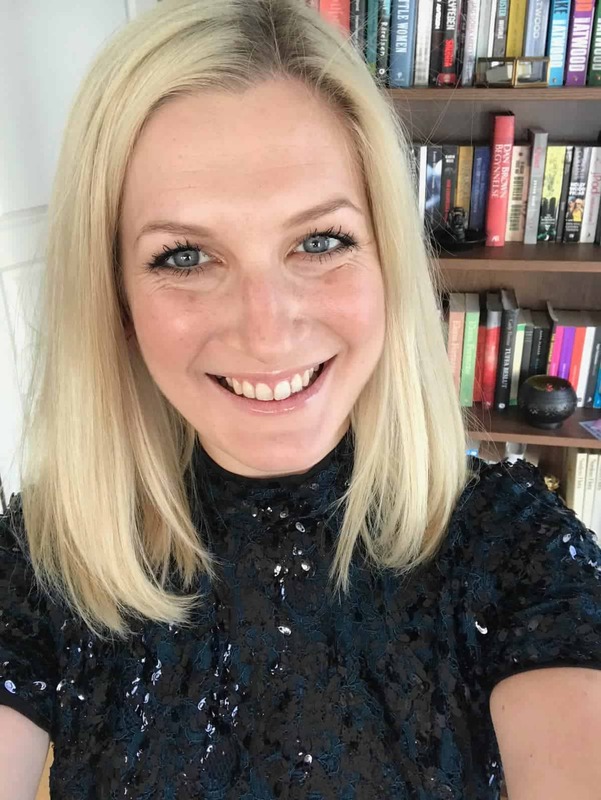 Please let me know what you thought by leaving a comment and a rating! And now – I’m off to finish off the last of my Walnut Pesto on top a nice piece of Italian bread. Yummy! Add all ingredients except the sun-dried tomato oil to a food processer and mix until all ingredients are at your desired coarseness. Add in the oil from the sun-dried tomatoes (or other olive oil if this is not enough). Mix, check consistency, and add more olive oil if desired. 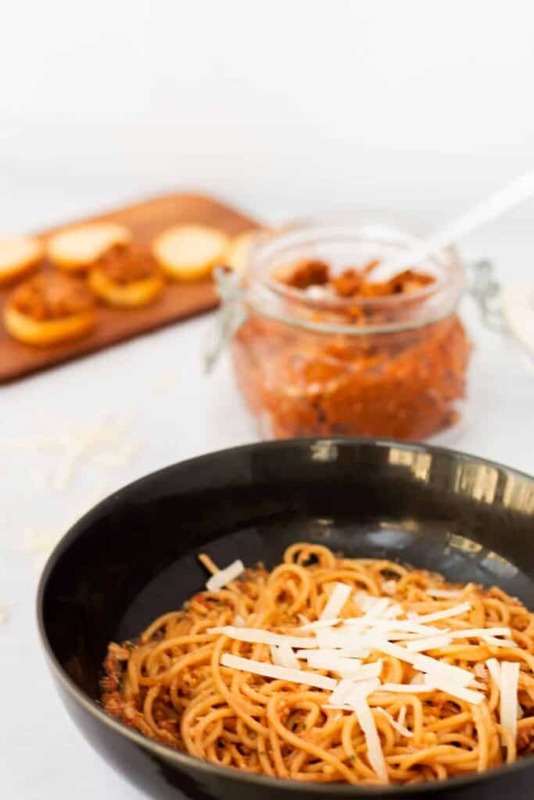 Serve on top of bread or crostini, with pasta, with meat or chicken or any other way you desire. I love pesto but I’ve never made walnut pesto! I’ll have to try this out sometime. Thank you, Sydney! Let me know what you think when you’ve tried it OK! I love this post. Never thought that making pesto would really be this straight forward and quite simple. That was really highlighted for me when watching your video. Also love the various different ways this can be used. I love sun dried tomatoes. I recently let me 2 year old try them and he inhaled them! I’ll have to let him give this recipe a try. Its something we would both love. Thank you for commenting, Kristen! That’s amazing haha, let me know what he thinks! It must be so delicious! I have never tried it before but I am pretty sure I will like it. How come I didn’t think of making it myself first place! Thank you for commenting, Lyosha! Yeah it’s sooo good. Not sure where the walnut idea came from but I’m happy I tried it! Thank you for commenting, Adriana! Let me know what you think! Such pretty pictures! I love the ease of making and storing this pesto. I can just imagine how great this taste .. I love everything in it pesto is a favorite her and we love walnuts too! This sounds just amazing! 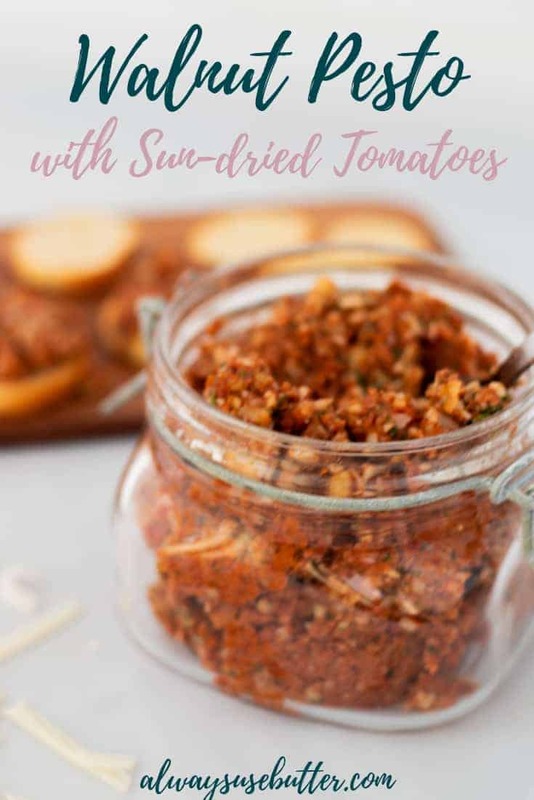 I love sun dried tomato pesto – its goes great on so many different things. Thank you, Danielle! Yeah I could have it on everything! Pesto is so good. I’ve never had it with walnuts. I’d love to try it. What a marvelous variation!! Sometimes the green pesto doesn’t color co-ordinate with the rest of the menu. I know, crazy as it sounds I color plan the meal. I love the visual appeal. This walnut pesto with the Sun-dried tomatoes looks wonderful with the pasta. We’re making some homemade pasta today and we’ll just have to include this recipe along with the pasta. Haha I love it Marisa! More dishes should be color coordinated! (I do this as well…) Thank you so much for commenting & hope it turns out delicious! I love pesto but I’ve never heard of walnut pesto! Never knew it was a thing. This recipe has me intrigued. May have to try it some time. The walnut pesto looks absolutely amazing. Thank you for commenting Byron! 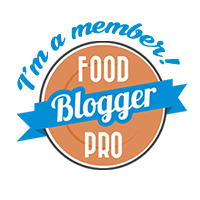 Yeah totally agree about expensive pine nuts – I think that’s why I started using walnuts for it instead, way back! Thank you Monidipa! Super easy! Hope you try it! I love pesto but haven’t tried it with walnuts before. I have to try it now because it sounds absolutely delicious!! Thank you so much Angie! Let me know if you try it! Looks perfect pesto nutty and crunch to pasta or as dip perfect treat. I am going to give it try. i am yet to try walnut pesto. Thank you so much! Hope you try it! This would be all sorts of amazing tossed with pasta and a little parmesan cheese. I love simple pesto sauces, and love that this one is a little different with the walnuts! Oh yes! Thank you for commenting! What a tasty post! I am so loving it. I would love to try this recipe and I really love pasta. Thanks for sharing it here.